When the starting gun for the Boston Marathon sounded Monday, there was no clear favorite to win the race. Suspense hung in the crisp air. Nearly a million spectators that had lined the famous course were left to scratch their heads and ponder how the exciting marathon would unfold. For the men’s race, would the defending champion and course record-holder, Robert Kipkoech Cheruiyot win for the fourth time? Or would the young American Ryan Hall, the top-seeded marathoner, be the first American man to wear the laurels since 1983? In the women’s race, could the Ethiopian, Dire Tune, repeat her stunning performance last year when she won in the final seconds? Or would the hometown favorite, the American Kara Goucher, break the tape? Or how about the woman who has run more sub-2:25 hours marathons than anyone on the starting line, Salina Kosgei? 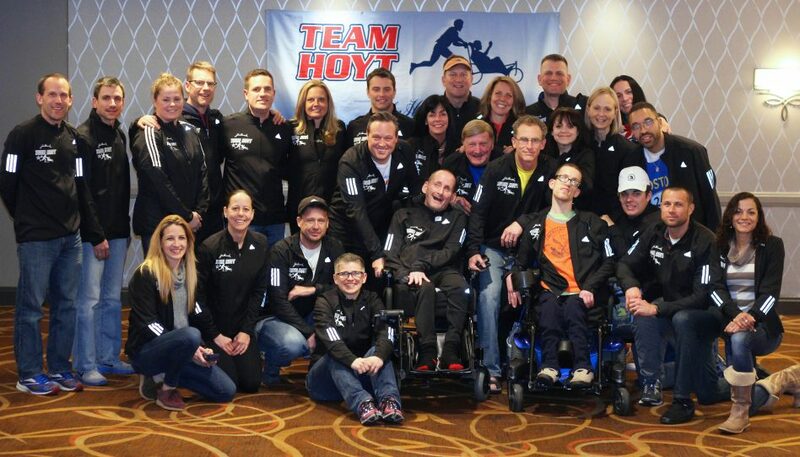 This year’s Boston Marathon did not disappoint—providing the closest finish in the history of the storied event. In the men’s marathon, Ryan Hall seized the early lead. Confident and relaxed, his powerful legs pounded down the early hills that roll along Route 135 in Hopkinton. He looked back several times, as if to beckon the rest of the pack to come with him. Of the entire elite field, only 12 other runners committed to go with him. The pace at the beginning of the race was mind-blowing. Their first mile: 4:38 minutes! They didn’t let up. At 5 kilometers, the leaders passed through in a blazing 14:33. It’s worth a moment to pause here to reflect on this split. It is a full 50 seconds faster than Robert Kipkoech Cheruiyot’s 5K split when he went on to set the course record in 2006. For the most part, Hall did the heavy lifting. His tall frame shielded the pack as he cut the strong headwind. 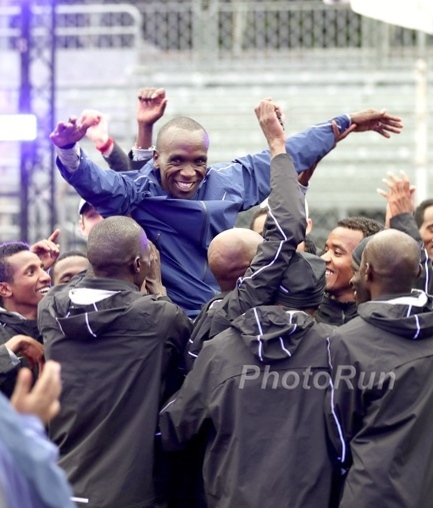 Occasionally, he shared the lead with the Ethiopians, Gashaw Asfaw and Deriba Merga, as well as Kenyan Robert Kipkoech Cheruiyot. 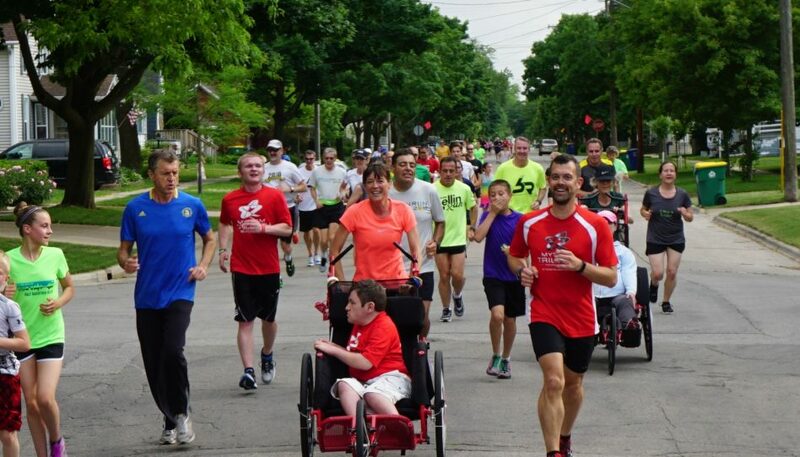 Race commentators questioned the judgment of the pack and wondered if those in the front would be able to maintain that brisk pace during the remaining difficult 40K. The race returned to reality by 15K. As the course flattened and the headwinds increased, the pace decreased. Eight of the original 13 in the lead pack all ran together. The remaining five were just seconds behind. Everyone looked strong. They crossed the half in 1:03:40 hours. The race appeared to stabilize. Nobody seemed to make a move. When was someone going to break up the monotony and take a chance? The man that eventually did it, Ethiopian Deriba Merga, is no stranger to taking chances and front running. In the 2009 Houston Marathon in January, he smashed the 20-year course record. And at the 2008 Olympics, he led the pack at a relentless pace during a hot, humid day—eventually finishing in fourth place and missing a medal by a mere 21 seconds. Would the same fate happen to him at Boston that happened at Beijing or would he be rewarded as he was in Houston? By the 35K mark, as the Newton Hills came and went, Solomon Molla faded and it was just Deriba Merga. It was his race to win or lose. Facing strong headwinds, he mounted Heartbreak Hill looking incredibly strong. His pace didn’t falter as he ran repeat 4:50-mile splits. Rono reeled in Molla, but wasn’t in striking distance. Hall was a distant third. In the final 5K, as the course wound into the city, Merga continued to look back for any signs of trouble. Nobody was behind him. The race was his. He crossed the line with his two hands in the air in 2:08:42 hours. Daniel Rono crossed nearly a minute later in 2:09:32. Ryan Hall, wearing a grimace of pain, came in third in 2:09:40. In the post-race press conference, Merga spoke through a translator and had this to say about his experience: “I felt tired with 3 miles remaining. I am happy to have won. Our people in Ethiopia are happy too.” He had a smile on his face as he was crowned in laurels and handed a large silver trophy. He will receive $150,000 for his victory. The women’s race began almost in the exact opposite fashion as the men’s race. After the starting gun went off, the pace was painfully slow. A large lead pack formed. The first 5K were run at a pedestrian 18:59 which is 2:40 hours marathon pace. Fellow Americans Elva Dryer and master’s hopeful Colleen De Reuck led the way. Kara Goucher was slightly behind and behind her, all the top-seeded East Africans. Despite the downhill segments at the start, the pace didn’t pick up. The race announcers were wondering why it was so slow and predicted a huge surge late in the race. The same pack crossed 10K in 37:06 (2:36 marathon pace). The race remained unchanged through 15K (55:40) with fellow Ethiopians Bezunesh Bekele and Dire Tune sharing the lead with the American, Kara Goucher. The pace didn’t alter at the half (1:18). The race’s dynamic looked like it would come down to a footrace in the second half. Tune remained in the lead with Goucher close on her heels. Colleen De Reuck, who appeared to fade, suddenly surged at the 30K mark and the pace quickened (1:50:52). And then, like the men’s race, everything suddenly began to unfold. Slowly, the leaders began to ratchet up the pace. The next 5K were run in 17:55—nearly a minute faster than the previous 5K. Runners began dropping back. By the 21st mile, it came down to just seven runners. And with three miles to go, it came down to three runners: Kara Goucher, Dire Tune, and Salina Kosgei. The pace was incredibly fast at that point as the three runners ran a blistering 5:11 mile. For the final two miles, no one could tell who would win the race. The noise was deafening as the crowed clapped and screamed excitedly. Would Tune repeat her win? Would Goucher be the first American woman to win Boston since 1985? Or would Kosgei, who surprised the world to win the 2004 Paris Marathon, the heptathlete who excelled at sprinting, break the tape? It was a real footrace. 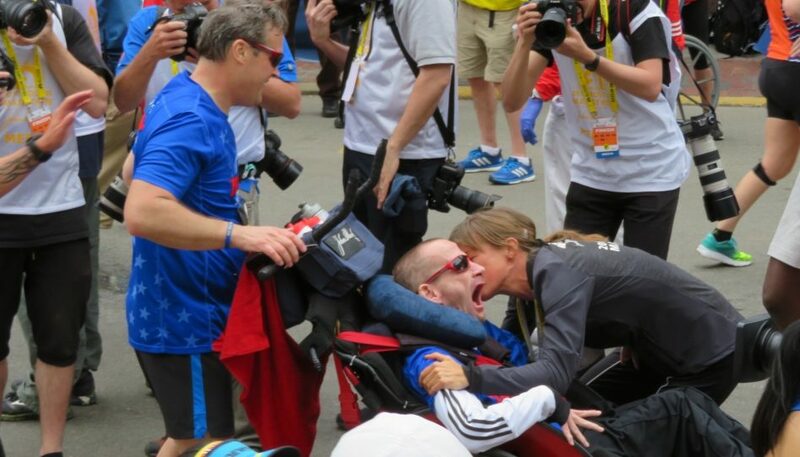 This was what the Boston Marathon is all about. As the runners turned right on Hereford Street, Goucher stripped off her gloves. She later admitted she did this for symbolic reasons—to show her competitors she wasn’t done. But by the time the three turned onto the final stretch along Boylston Street, Tune and Kosgei had put on the jets and dropped Goucher. In the final 200 meters Tune and Kosgei flailed their arms and legs—opening up their stride. They were so close to each other, they were literally touching. It looked as if the two were going to tie, but just before the tape, Kosgei surged one final time, leaving Tune to drop back. Salina Kosgei broke the tape in 2:32:16. Tune crossed 1 second later in 2:32:17—making this finish the closest finish in the entire history of the Boston Marathon! Goucher placed third in 2:32:25. Just a step after the finish line, Tune collapsed, and was surrounded by medical personnel. She was taken to the hospital and later released. In the masters division, Colleen De Reuck won the women’s race (2:35:37) and James Koskei won the men’s race (2:14:52). In the post-race press conference, Koskei announced that he was “very happy” today and that he thinks he is in the shape to go for the master’s world record which is 2:08:46. 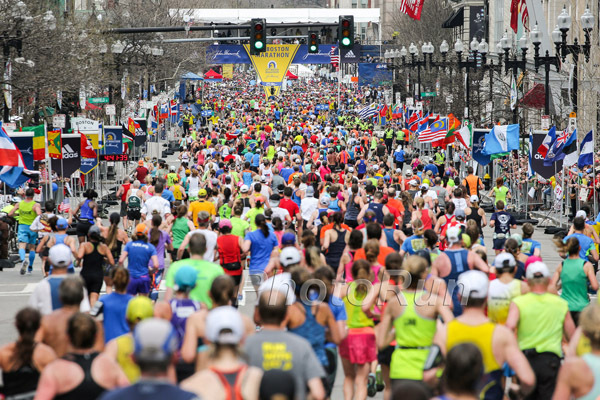 All in all, a total of 23,000 runners took part in the 113th Boston Marathon. Anyone who wants to witness the sport of marathoning in its purest form should spend a day either running in or watching this magnificent race.